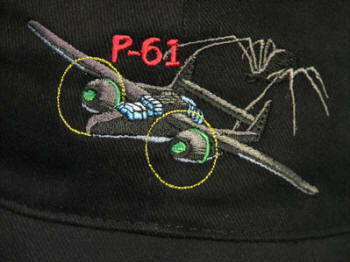 Mid-Atlantic Air Museum's P-61B Recovery & Restoration Project - Join the Team! 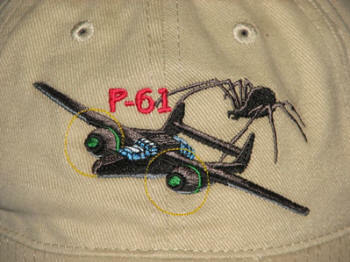 For more than forty years P-61B 'Black Widow' 239445 had lain neglected on a distant foreign mountainside. The aircraft was all but forgotten and would have remained lost were it not for the single-minded determination displayed by the Mid-Atlantic Air Museum's co-founder Gene Strine in finding, recovering, and restoring this one-of-a-kind World War II combat aircraft. Although the total recovery and restoration costs will represent an estimated 2.2 million dollars, a monetary worth cannot be placed on this rare, historic and valuable aircraft. Its worth can be attributed to the value we place on the men and women who designed and constructed this unique fighter, and to those brave men who flew and maintained this great aircraft. $50 - You will receive a P-61 Black Widow Recovery and Restoration Team Certificate, suitable for framing as our thank-you gift. 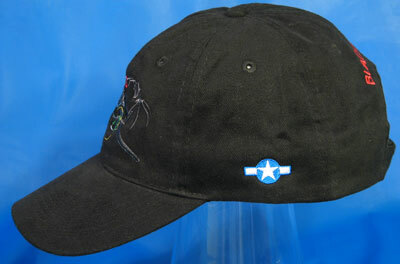 $100 - In addition to the above certificate, you will get a souvenir piece of P-61 aircraft skin from P-61B "42-39445". This skin, approximately 4 inches square, was removed during restoration and comes with a certificate of authenticity that it is a piece original to the aircraft. In addition, your name will be engraved on the P-61 "Sponsor's Wall" in the Museum. $250 - You will receive the certificate and a P-61 Support Team hat. 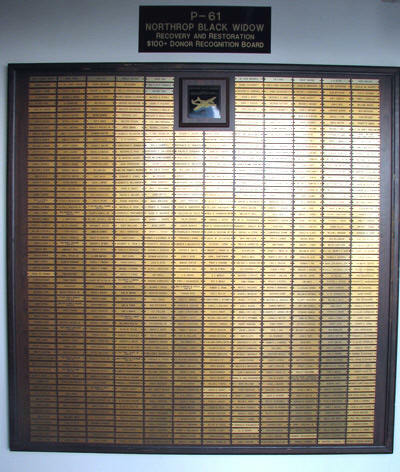 In addition, your name will be engraved on the P-61 "Sponsor's Wall" in the Museum. $500 - You get the certificate and an autographed copy of "Forgotten Widow". In addition, your name will be engraved on the P-61 "Sponsor's Wall" in the Museum. $750 - You will receive the certificate and a resin-cast, hand-detailed 1/72 model of a P-61B. In addition, your name will be engraved on the P-61 "Sponsor's Wall" in the Museum. $1,000 or more - You will receive the certificate, plus a limited-edition P-61 print by David Lee Sample. In addition, your name will be engraved on the P-61 "Sponsor's Wall" in the Museum. Even if you can not afford to donate at one of these levels, every dollar counts and we will be grateful for any support you can give. 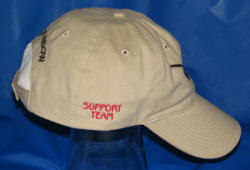 You may donate as little as $5 by credit card on our MAAM Online Store. Thank-you. 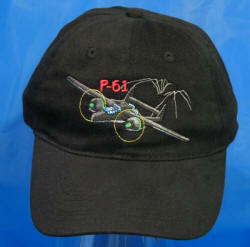 Specially commissioned by the Mid-Atlantic Air Museum exclusively for supporters of the P-61 Black Widow Recovery and Restoration Project, these classic baseball hats are made of washed Chino, come in tan or black, and feature a pre-curved bill and Velcro closure. 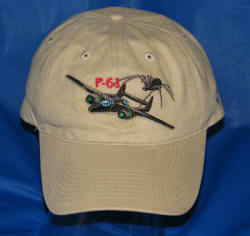 A beautifully embroidered Northrop P-61 in flight and a black widow spider adorn the front and the words, BLACK WIDOW are embroidered on the back. The sides feature a blue and white roundel on the left and SUPPORT TEAM on the right, proudly announcing your personal support of this historic project. The price is $30.00 and you can pick yours up at the Museum Shop or order it from our On-Line Store in tan, or perhaps you prefer black. to use your credit card. The success of this project DEPENDS ON YOU! Your commitment and generous financial support is urgently requested. With your help this important aircraft will fly in the freedom they fought so hard to preserve.